Many families are getting ready to settle into a new home as summer wraps up. School is getting ready to start and it’s time for the whole family to settle back into the school-year routine. Having a new home can be exciting, but it can also be challenging. Perhaps the kids have a new school district, you have a new job, or a new commute time will take some getting used to. 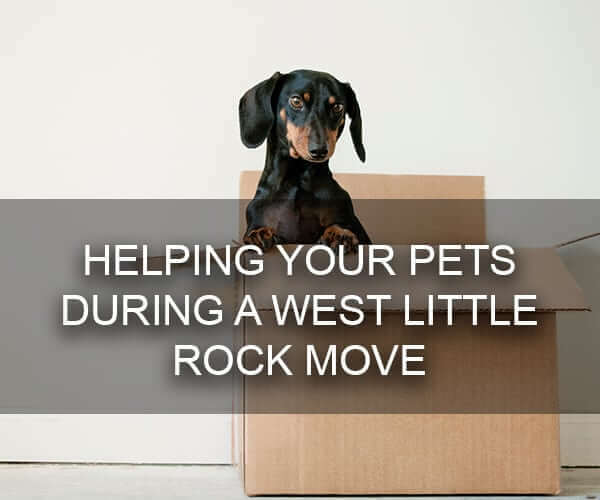 It’s not just the human members of your family that will need time and patience to settle into your West Little Rock home. Your furry family members do as well. Here’s what you can do to help your pets relax and settle in during and after your move. Moving requires a lot of upheaval. Everything is being put into boxes, moved onto trucks, and transported to a new place. If you’re like most families, this is not a one-day – or even a one-weekend – process. This means that the chaos may be going on for a couple of weeks or more. As much as you can, keep your pets away from where the action is happening. You may choose to use a gate to close off a room that you’re currently packing. Or, you may decide to keep your pet on a different floor while you pack and move your items. You want to make sure your dogs, cats, and other animals are not underfoot during your moving process. Not only can it stress your pet out, they can get injured and need a trip to a West Little Rock vet. Once you get your pets to your new house, you may want to let it out right away. Don’t make this mistake! Without you there to calm them, your pet may panic and try to escape. In an unfamiliar house in an unfamiliar neighborhood, it’s easy for them to get lost. During your move, the door will be open as people carry boxes into your West Little Rock home. Unfortunately, this creates a lot of opportunity for escape. Keep your pet secure until all doors are closed and you are permanently there. As you settle into your new home, help your pets adjust as well. Make sure you’re in touch with an excellent West Little Rock vet like Bowman Road Animal Clinic. We can help you if there are any injuries or illnesses after the move. Carefully check any fencing that your new home has before you let your animals outside. Most of all, make sure you set up the home with familiar toys and scents that they had before. Often when a cat or dog can smell your scent and their own scent on their toys, bed, and other items, it helps them feel safe and secure even in a new area. This safety area gives them a great home base that they can explore from. If you’re looking for a new West Little Rock vet, we’d invite you to give Bowman Road Animal Clinic a call. We’ve been serving this area for many years, and we’re excited to have your family join us. Whether you need boarding, annual checkups, or specific medical care, we’re here for you and your furry family member. Contact us for more information today!